At the Ronald McDonald House, we try to create an atmosphere that invites all to feel at home. Guest families may get the chance to ‘play’ with the dogs from Hand in Paw, make a craft with a group of volunteers, or even compete with one another on our video game system. Anything that can help the families relax, enjoy themselves and forget about all the things going on, steps away, at the hospital. The Fairytale Project, a local non-profit, has recently started a new type of activity at RMHCA. 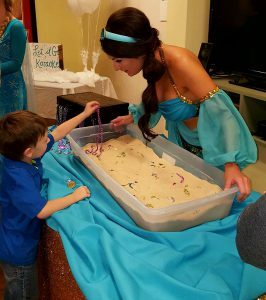 This group of volunteers hosts monthly ‘Princess Parties‘ that create an atmosphere that is truly something from a fairytale. Each party has unique activites and even new princesses. As you can imagine, these parties are a family favorite. 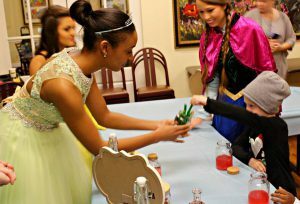 In late November, The Fairytale Project hosted their monthly party at RMHCA. They allowed guests to created their own “Pixie Dust” necklaces. Each child could choose from different colored “Pixie Dust” that represented different qualities: love, courage, bravery, happiness, faith, etc. One of our guests, Mollie, had received a chemotherapy treatment earlier in the day, she noted that she filled her necklace with extra “bravery.” Moments like this truly highlight the innocence of children who are struggling with so much adversity. During past parties, The Fairytale Project has had karaoke, face painting, digging for treasure (with Princess Jasmine), snowflake making (with Olaf) and so much more. These nights provide an escape that each child needs during their stay. We are so thankful for these magical nights. 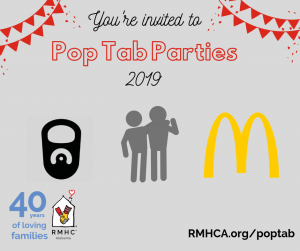 To support RMHCA through activity nights >click here< to learn more. You can always find more pictures on our social media pages: Facebook, Twitter, Instagram or Flickr.